Mini Stars: where mistakes are part of success! Alberta Soccer’s Mini Stars is an Introduction to Excellence Program where every player is encouraged to reach their full potential and nurture a passion to play! The Program provides a fun, yet challenging, standards-based training environment where the player always comes first. Mini Stars is open to children who are at the Learning-to-Train Stage of Canada Soccer’s Long Term Player Development Plan (born in 2007, 2008, 2009) and anyone can register! 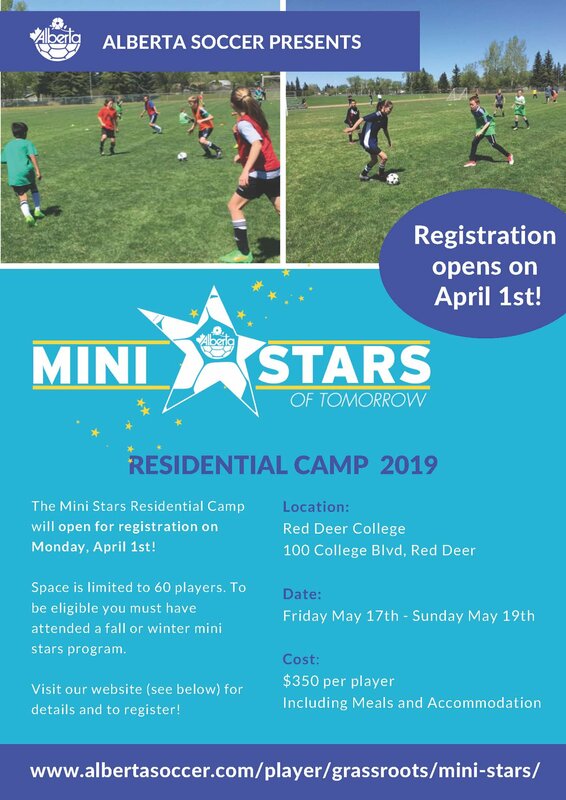 The 2019 Mini Stars Residential Camp is open to ALL players born in 2007, 2008, and 2009. Click here to register for the Mini Stars RESIDENTIAL CAMP! We are delighted to confirm that the Mini Stars Residential Camp will again welcome 60 players on a first-come, first-served basis. As in the past, the camp will be held in Red Deer at the Red Deer College, with players staying overnight on campus. The dates for the weekend are May 17-19 and the price for the full board camp is $350. Alberta Soccer is excited to welcome players born in 2007, 2008, and 2009 to take part in the 2018 Mini Stars Winter Program. Session B: 5:30-7:00 PM on Oct 21, Nov 4, 18, Dec 2, 16, January 6, 27, Feb 3, 24, Mar 3. Registration is now closed for the 2018 FALL Mini Stars Programs. We’ve had all our four of our daughters go through the Mini Stars program and it has had a major positive impact on their soccer development. The extra training has been incredibly beneficial and really improved their skills. The coaches have been excellent and the kids are encouraged to take risks, which builds their confidence and creativity as they learn to become better soccer players. It has been a great experience for the girls to meet and play soccer with other motivated, high-performance players from a variety of different clubs from all over the city and many new friendships were made. Most importantly, Mini Stars was consistently described by them all as FUN! The Mini Stars residential camp was their first experience playing soccer away from home and was another growing experience. Being surrounded by like-minded kids really challenged our girls and motivated them to progress in soccer. The Mini Stars showcase and graduation game was a nice conclusion to the program and the girls really felt a sense of accomplishment. Finally, Mini Stars was their first glimpse of future opportunities available through Alberta Soccer and Canada Soccer. Mini Stars prepared them well for these other soccer programs, which included the ASA Winter training program, the Alberta South Provincial Team, the Alberta South WFC REX team, and, for one of our girls, even the Whitecaps Girls Elite REX team in Vancouver (Canada Soccer Supercentre). For kids who love soccer, we highly recommend Mini Stars!